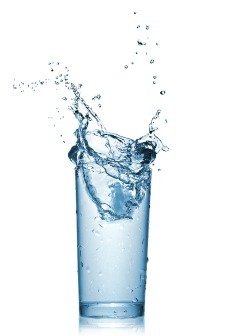 Next to oxygen, the benefits of water is the most important nutrient the body needs. We can survive without food for many days, but not without this precious liquid. It hydrates us, helps carry nutrients, detoxifies the body, and increases your metabolic rate. It also plays a huge role in weight loss and is necessary for the body to run efficiently. It must become second nature to hydrate your body throughout the day. Drink a glass of water before your meals. It makes you feel full and then you can’t eat as much and it also helps prepare the body for the digestive process. If you can manage it, try not to drink any liquids during meal time as this dilutes your digestive juices. Waiting 20 – 30 minutes after meals before drinking any liquids is ideal. Your health and weight depends on the strength of your digestive system. Soft drinks do not provide your body with any nutrients and can sure add on the calories. So if you enjoy a cola or carbonated drink, switch your sweetened bubbles for a refreshing bottle of sparkling water. You can always add a nice slice of orange or lemon which will only add to the benefits of water. One of the most popular beverages consumed worldwide is tea. Ever try drinking a cup? There is a wide variety of teas to choose from that all give water a special flavor, aroma and certain health benefits. The list of teas could go on for pages, but to name a few would be green, white, black, Oolong and herbal infusions. Some of them taste absolutely divine. Teas are great because you can enjoy them hot or cold. You can also add honey and lemon to them or just drink them as is. Whatever the case, it is a great way to hydrate your body and enjoy the many benefits of tea. For instance green tea has a list of benefits from increasing metabolism which helps in weight loss and may have cancer fighting properties according to the latest studies. Also certain herbal teas are helpful such as chamomile, which is known to help calm the nerves, ginger can aid in nausea and senna can help alleviate constipation. Of course this is just the tip of the iceberg.The above listed teas are just a few of the many you can choose from. There is an abundance of choices, each offering amazing tastes, aromas and benefits. Have fun and don’t be afraid to try something new. Get to know which flavors excite your taste buds. Another great way to enjoy the benefits of water. When you are hungry your body is cleansing itself which aids in weight loss. Do you every get that rumbling hungry feeling in your tummy? That feeling is actually a good thing. When we have less food in our tummies our bodies are in cleaning mode. Toxins are being eliminated and calories are being burned. It’s always a good thing to be hungry for an hour or two if you can manage it. Drinking water during this time is perfect. It helps the cleansing process, makes you feel full for a little while and water has no calories. If you don’t like to wait it out there is always the comfort of fruit if you want a sweet snack that takes little or no time to prepare. There have been countless medical studies proving that an animal’s life span is increased when their food intake was decreased. The reason for this is that your body has a chance to better eliminate toxins when it doesn’t have to work so hard digesting large amounts of food that we eat. Take Dr. Clive McCay for example. He was a professor at Cornell University. 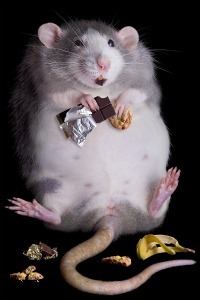 He was best known for proving that restricting calorie intake increased the life span of rats. His studies showed that eating less promoted longevity. In one experiment he took a group of rats and cut their food intake by half. The result was that those rats doubled their life span compared to the group of rats that ate twice as much. Similar studies have proven that this applies to humans as well. Less food intake slows down the aging process. So what does all this mean? We don’t need to eat a lot; we just need to eat smart. This way our bodies efficiently use the nutrients it needs without long digestion and weight gain.